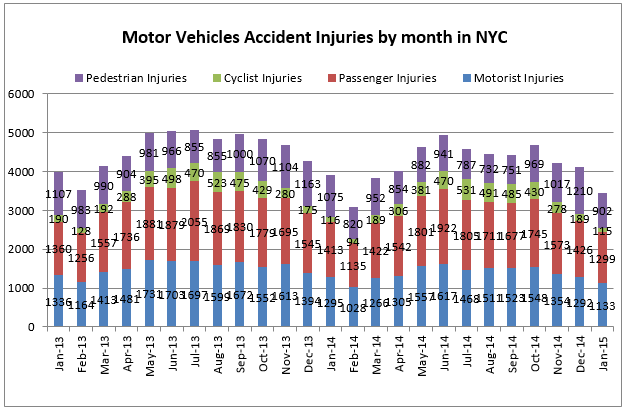 3449 people were injured and 13 people died in traffic accidents in New York City in January 2015 compared to respectively 3899 and 21 in January 2014 , 3993 and 28 in January 2013 and 4179 and 21 in January 2012. These numbers are encouraging and may indicate that the Vision Zero Program started approximately a year ago may be effective in making New York City streets safer. 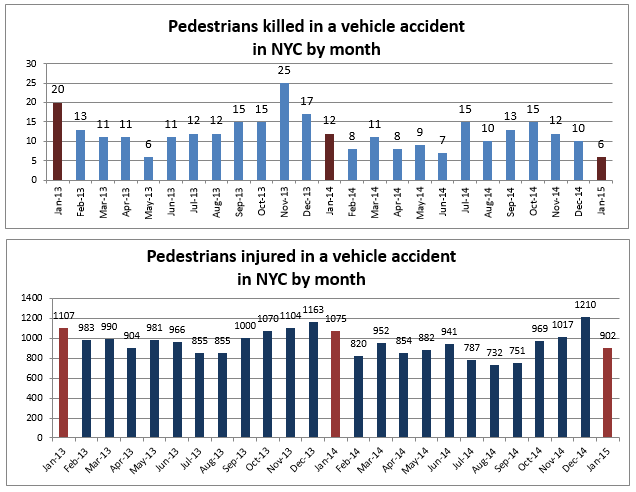 Data from December 2014 and January 2015 also show, for the first time, two consecutive months during which the total monthly number of traffic fatalities was below 14. The total number of motor vehicle accidents was stable. 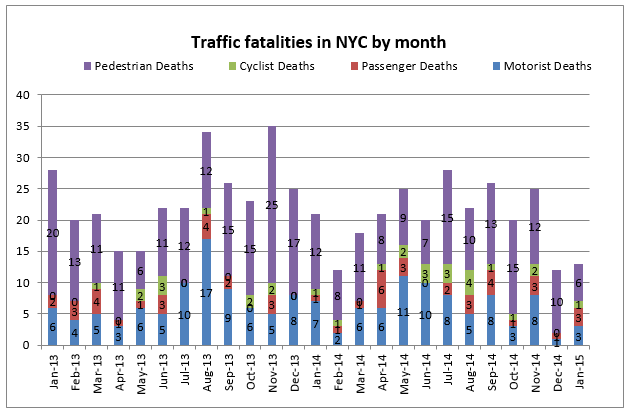 Below are graphs depicting traffic accident rates from January, 2013 to January 2015 for various types of accidents for each month for this time period in NYC. 6 pedestrians died in traffic accidents in January 2015 compared to 12 in January 2014, 20 in January 2013 and 12 in January 2012. This is the lowest number since May 2013. This is also half the number recorded the same month a year before. In January 2015, 902 pedestrians suffered personal injury after being struck by a car compared to respectively 1075, 1107 and 1045 in 2014, 2013 and 2012. Its the first time that this number is below 1000 for the month of January. 115 people were injured and 1 person died in bicycle accidents in January. 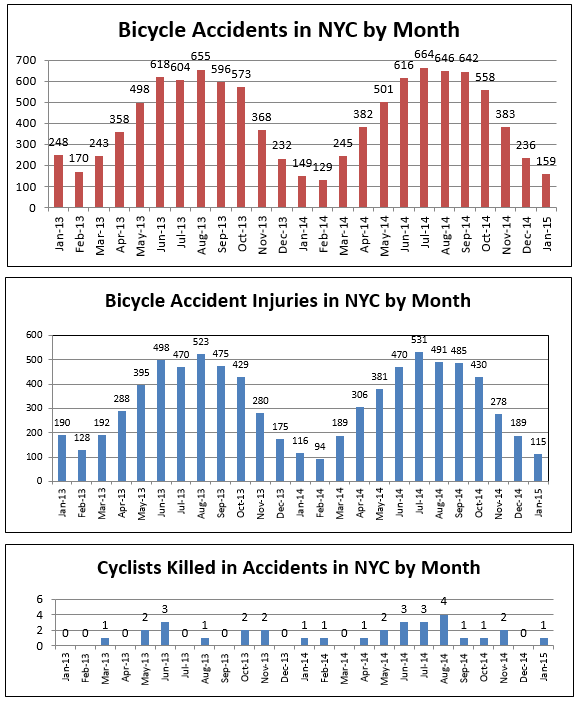 Bike accidents are usually at their lowest in New York City during the months of January and February because less people use their bikes because of the bad weather and the snow. 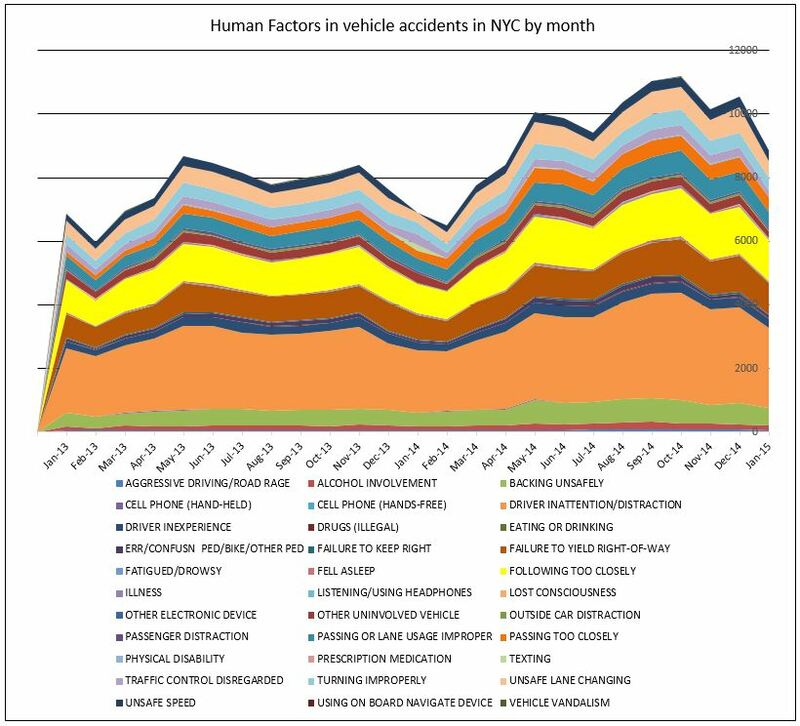 Driver inattention continues to be the primary cause of traffic accidents in New York City. Following too closely, failure to yield the right of way, passing or improper lane usage as well as passing too closely are also the cause of many vehicle collisions in the city.